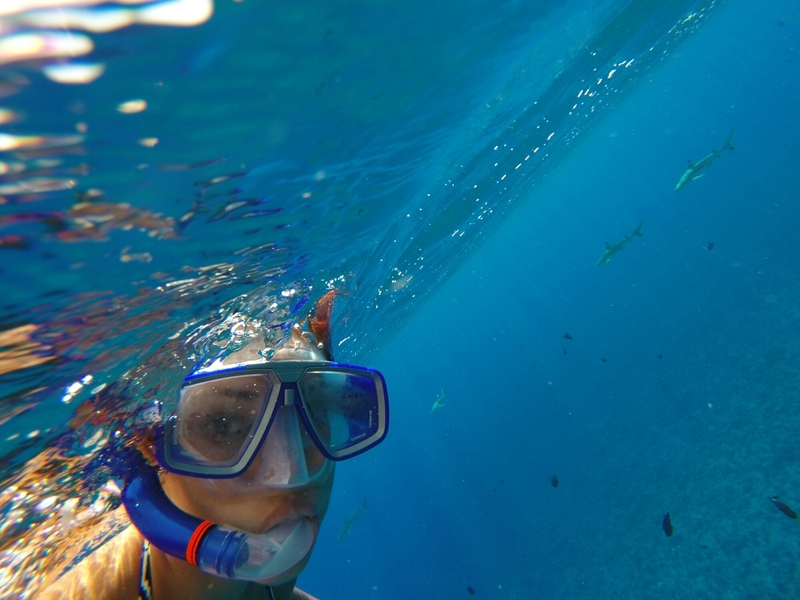 Swimming with black-tip sharks was definitely an experience of a lifetime. Although, these are not comparable to the great white or the tiger shark, it can still be scary at first to jump in the water with them. Especially, if it’s in open ocean, where it is easily 100 feet deep at least. This is what happened to us when we decided to buy the tour. Now, there are so many tour companies on such a small island. Which to choose from? Most of these tour companies are way too expensive, they don’t allow much time or, vice/versa, give you way too much time and are extremely crowded. These companies also have contracts with a specific aquarium where they keep the sharks in captivity for people to go day in and day out to feed them. Which in my opinion is not very safe, since this is making the sharks associate humans with food. I don’t know about you, but I would not want a shark, no matter how small, associating me with food! On the other hand, we were lucky enough to have gone at a time where most tour companies were closed due to a local holiday, which in return, forced the hotel to recommend a private boat with the captain being our tour guide for the day. This turned out to be better since our “tour guide” was a local who knew the waters well and did this often. This gave us one on one time with the captain and more options for us to do what we wished. 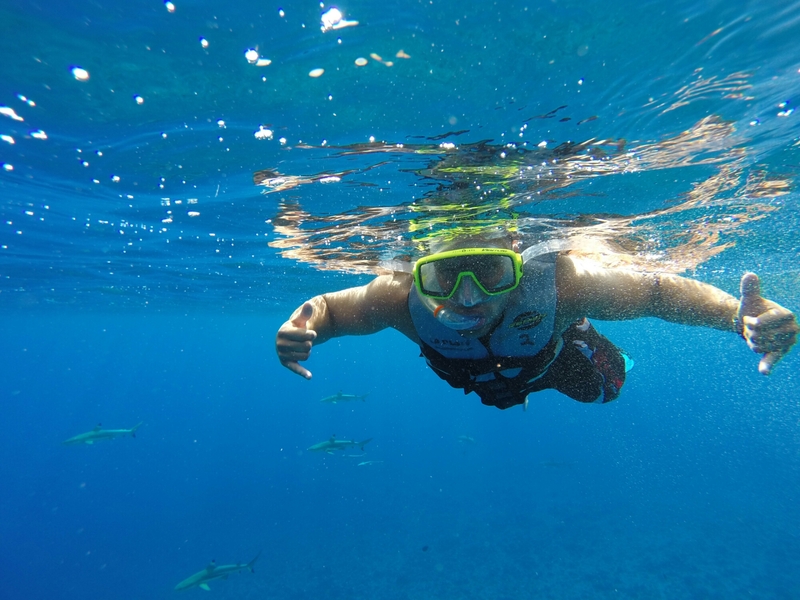 Whether it was to swim with the sharks for 5 minutes and later going snorkeling if we didn’t like the sharks or swim with the sharks for the full 3 hours we paid him for. The private boat we rented cost $300 for 3 hours of whatever we wanted to do and, luckily, we split this with a couple who came with us to Bora Bora. A private boat, however, could be split between 3 couples, if needed. But this also depends on the size of the boat and/or the group going. , freaking out. 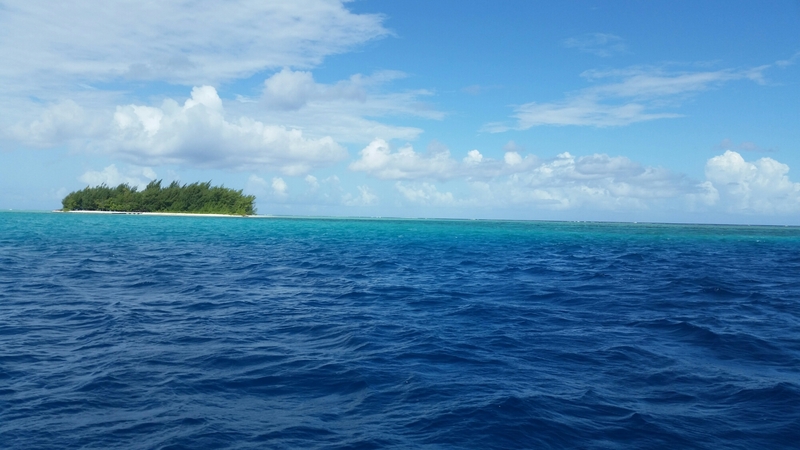 The water is a deep, royal blue color yet, crystal clear all the way to the bottom. My heart is pounding until he stops the boat and says the dreadful phrase we’ve been waiting for, “are you ready?” Our hearts sank. (Pun intended) We look at each other and start to rethink our decision until we look at him and he’s getting ready to jump in! What a relief! 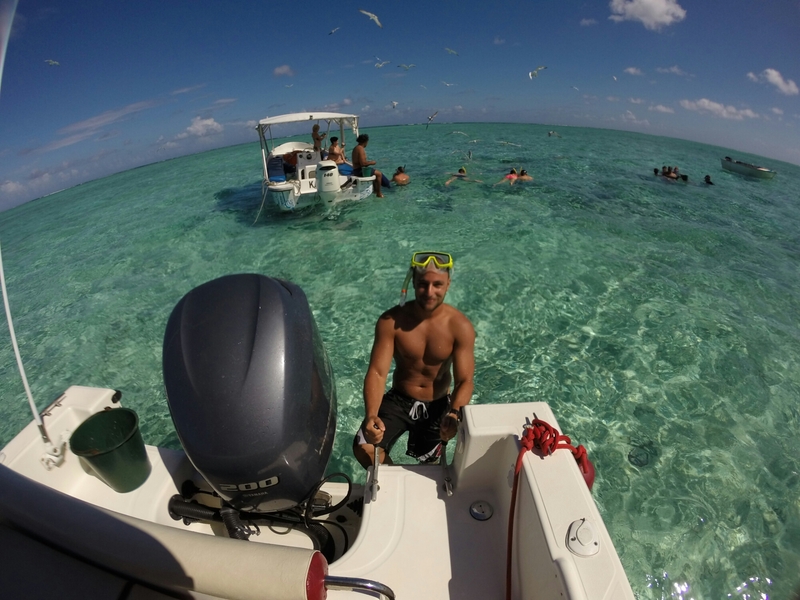 He then jumps in and dives straight down to the nearly 100ft deep water to secure the anchor of the boat. 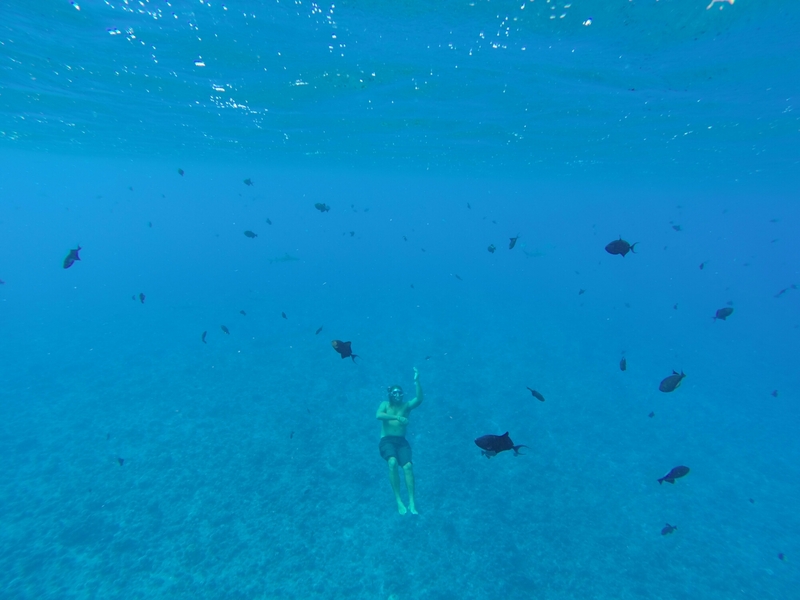 There are sharks everywhere. So one by one we jump in slowly. Careful not to startle them but they seemed tame and calm. More calm than us by far. We were crapping our pants but it was completely safe. The sharks were ultimately minding their own business and were quietly observing them in their natural habitat. It was amazing. It was stunning! So many colors and so many water creatures. 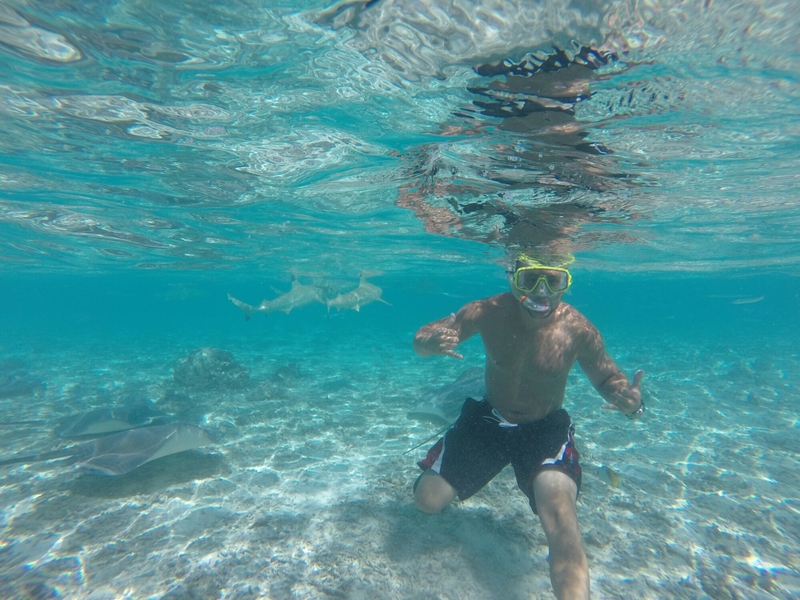 You couldn’t take a picture (underwater) without getting some kind of fish or sting ray or even shark in the background just swimming by. 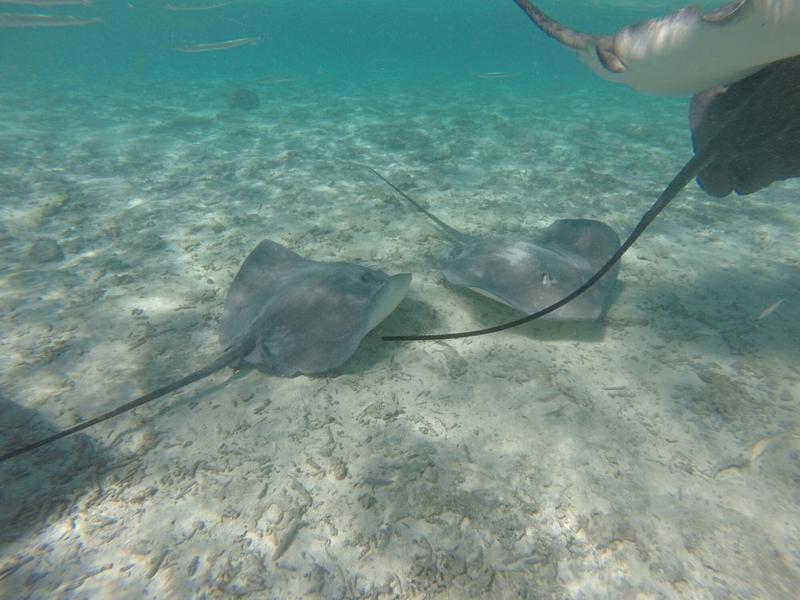 The sting rays were especially friendly. They would come right up to you to introduce themselves and sometimes flap their fins on top of the water as if waving hello. This was definitely an experience to remember. 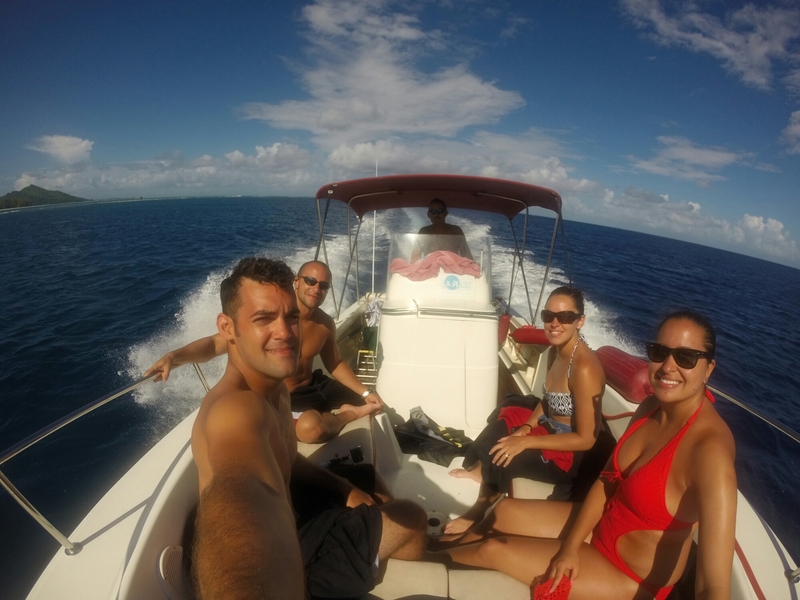 Between the 50 shades of blue of the ocean and the underwater wildlife, this tour was unforgettable. We enjoyed every second of it. Absolutely, no regrets. It has even opened up the idea of cage diving with the big guys like great whites or tiger sharks in the near future. Who knows?! Stay tuned and find out! 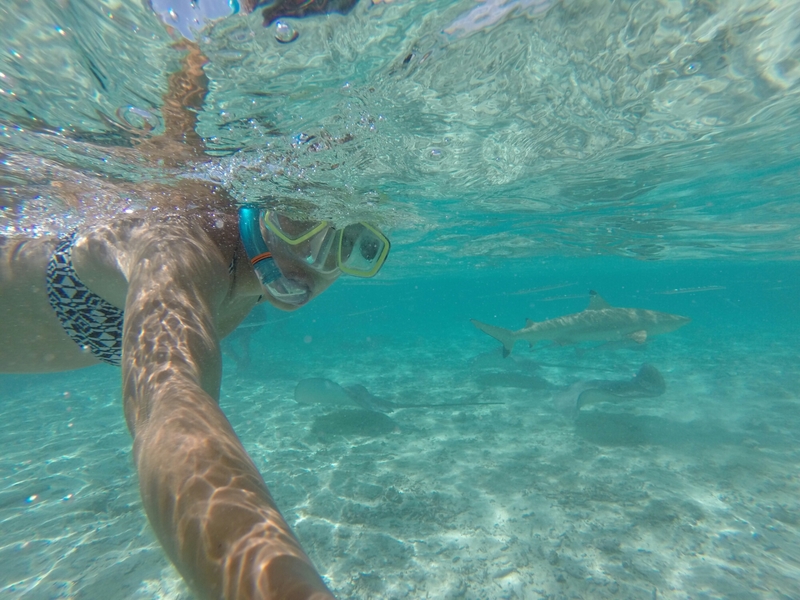 This entry was posted in Tahiti & Bora Bora, Travel Ideas, Travel Tips, Trip Reports and tagged beautiful waters, blacktip sharks, Bora Bora, InterContinental, Intercontinental Le Moana, intercontinental thalasso, resorts, swimming with sharks, Tahiti, tours, underwater wildlife. Bookmark the permalink. 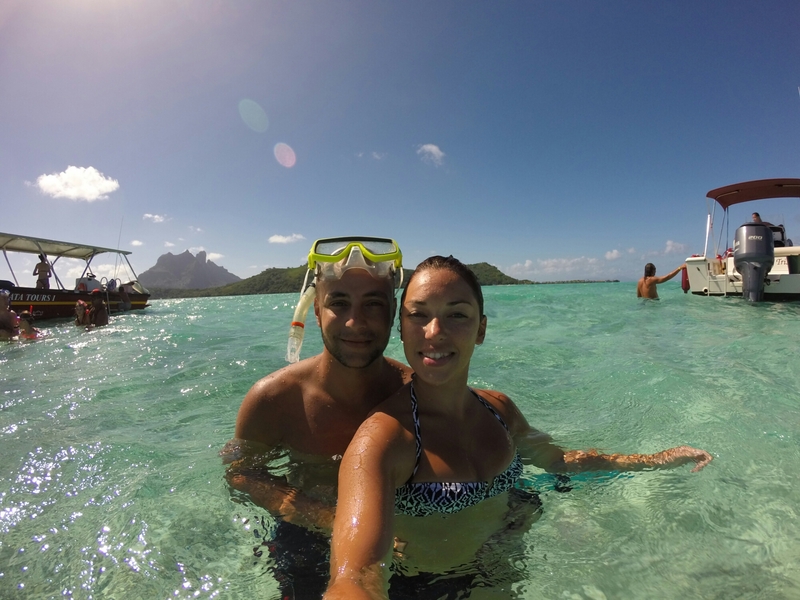 ← How we stayed 6 nights for FREE in Bora Bora.